This is a recording I have wanted to make for a long, long time. I have enjoyed many of these songs since I was a child, and others are tunes I discovered while researching old music for use in film scoring. There are twenty cuts on this album – each was popular in America in the 1800’s – I think you will find them to be interesting as well as entertaining. The 19th century was an exciting time for The United States. The most powerful military in the world had been defeated by this up-start nation two times and it seemed the country was here to stay. Americans had plenty of optimism, plenty of opportunity, plenty of land with plenty of resources needed for a prospering economy, and, if you were not a slave, you had freedoms no citizen of any previous society had ever experienced. The 1800’s saw the music business grow and prosper as the American experience was documented in song. Songwriters captured the excitement of living in this young republic. They wrote about all aspects of everyday living: love, work, faith, death, family, politics, leaving home, dreaming of home, coming home, humor, and the experience of being a slave in this mostly free country. 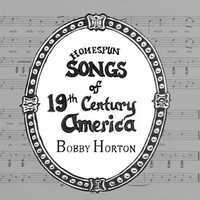 Many of these 19th century songs are still loved and sung by adults and children in America today. Like all my previous recordings, these arrangements are my own, I did all the singing and playing (on mostly period instruments) on these tracks, I wrote the liner notes, recorded and mixed here in my home production studio — hence the name "HOMESPUN" in the title.